As Hurricane Florence approached the East Coast last week, one man began planning an elaborate evacuation. Tony Alsup decided to drive a big yellow school bus from his home in Greenville, Tennessee, toward South Carolina and into the path of the impending storm — but there was a reason behind his odd route. On September 10 — four days before Florence made landfall — Alsup shared his plans on Facebook. "I'm en route to SC to be better positioned to respond," the truck driver wrote. He was responding to a cause he is passionate about: rescuing animals. Alsup drove his school bus to several animal shelters in North and South Carolinas. He was on a mission to fill the bus with dogs and cats who would've been at risk as the dangerous hurricane approached. Alsup continued to use Facebook to give updates on his mission to save animals from the coming storm. By September 11, Alsup and his school bus had arrived in Myrtle Beach, South Carolina, and paid a visit to the Humane Society there. "I will be loading the bus to maximum capacity tonight and arriving in Knoxville at approximately 6AM Wednesday morning," Alsup wrote. "The bus will have approximately 80- 90 cats and dogs on board." Later that day, Alsup got the emergency notice on his phone that everyone in the area received: "Residents must leave all zones under mandatory evacuations." With an evacuation order in place, Alsup knew it was crunch time. He worked quickly to evacuate pets from four South Carolina towns in about 24 hours. He then made his way to North Carolina, where he made his rounds to shelters there. To date, Alsup has loaded 64 animals — 53 dogs and 11 cats — into his bus to escape the flooding, the Greenville News reports. According to his Facebook posts, he is still traveling around to pick up more animals and bring them to safety. With his bus looking more and more like Noah's Ark, Alsup will transport the animals to an awaiting shelter in Foley, Alabama, according the Greenville News. From there, the shelter will help the pets find new homes throughout the country. Knowing he had too many cats and dogs for any one shelter, Alsop encouraged people on Facebook to adopt or foster some. 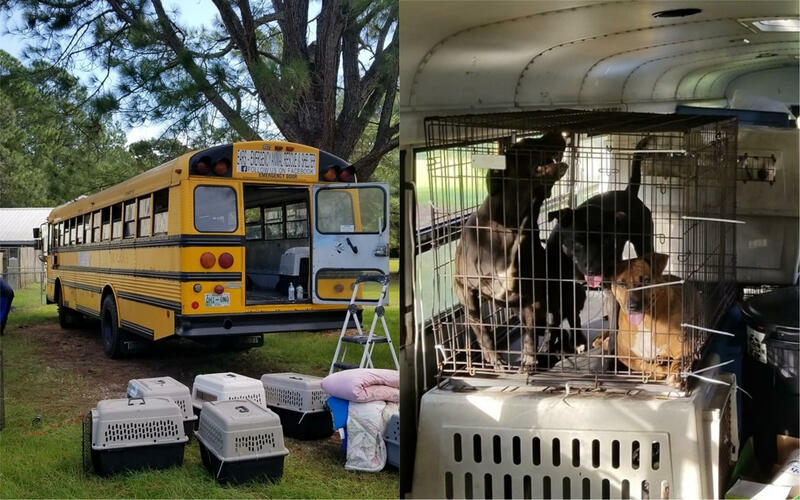 Photos and videos from his long journey show Alsup's hollowed-out bus filled with pet kennels as he drove through the pounding rain. It's something he has has done before, the Greenville News reports. He bought the old school bus last year so he could drive to hurricane-ravaged Texas and Florida and save animals there, he told the paper. He also flew to Puerto Rico to help animals after Hurricane Maria. Alsup says sometimes he hauls supplies in to hurricane zones — and he always hauls dogs and cats out. Rescuing animals has become his calling, he said.